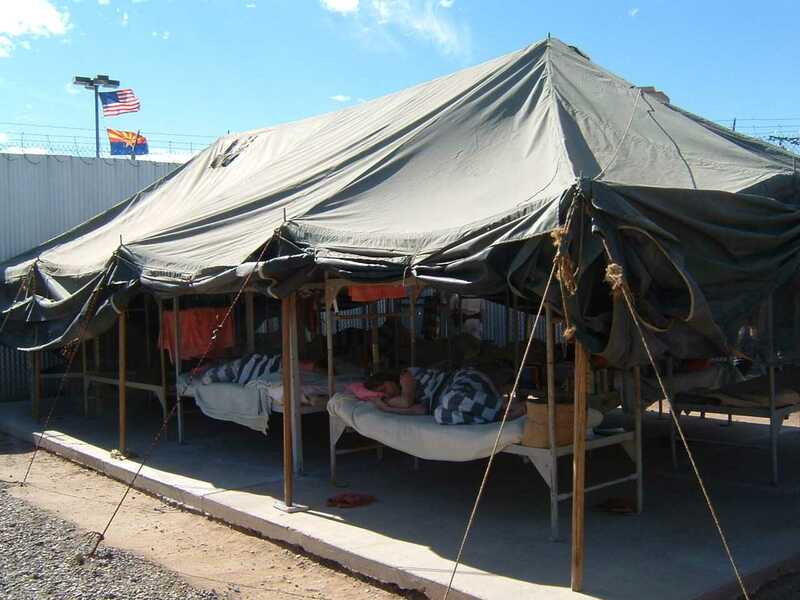 Tonight– June 23– the Unitarian Universalists, Puente Arizona, and members of other liberal groups, including Progressive Democrats of America, will hold a peaceful vigil at the Maricopa County Tent City Jail to protest cruel and unusual punishment of immigrants and other prisoners. Just as we all had expected, another stunt meant to undermine enforcement of immigration laws, the passage of SB1070, and of Sheriff Arpaio who enforces those laws has been launched! Left-wing and Marxist agitators are planning what their organizers claim to be a “massive protest” on Saturday evening, June 23 at 8 PM at Sheriff Joe’s “Tent City”. Many of these agitators are being bussed in from out of state in order to do the dirty work required to unseat the good Sheriff in November. RidersUSA has been called upon by a number of organizations, including our friends at Sons of Liberty Riders to stand with them against the enemies of this country, our Constitution and the American way of life! It’s time again to support the Rule of Law and show that “we the people” will not stand for outsiders, criminals and their supporters to take over our streets without facing resistance from dyed in the wool, American Patriots! We need to send a strong message, that the Rule of Law reins Supreme in this Country and no amount of pressure from these assorted groups of anarchists, open borders proponents, Socialists, Marxists and general malcontents will ever gain the upper hand! “Not in our house, not in our town, not in our country” is our firm commitment!!! 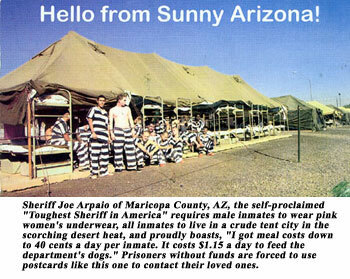 If you would like, please meet with fellow RidersUSA members and our friends at Sheriff Joe’s Tent City. Parking of the bikes will be at 3226 West Durango Street (35th Ave & Durango), Phoenix. We will begin grouping here between 7:00 and 7:30 PM. Bring water and a flashlight. Bussed in to do their dirty work? Approximately 4000 Unitarian Universalists from across the country are in Phoenix this week for their Justice General Assembly– four days of social justice workshops, worship, and witness actions… like the action tonight at the jail. As for “dirty work”, it has been reported that the Unitarians were caught singing in downtown Phoenix the other day. The vigil starts at 8 p.m. I’m hoping that the Side of Love will wash over the Tea Party, Sheriff Joe, and that abominable Hell Hole they call the Tent City Jail. This entry was posted on June 23, 2012 by Pamela Powers Hannley in Arizona, democracy, economy, Immigration, Joe Arpaio, Political corruption, Politics, racism, reform, Republican Party, Scandal, Tea Party and tagged Joe Arpaio, Maricopa County, Standing on the Side of Love, Tent City, Unitarian Universalists.